The 7 Best Fly Fishing Spots in Nebraska! When you think of Nebraska, you might not think of fly fishing. However, the state has a number of rivers, streams, and lakes that make it a prime habitat for a variety of fish—especially trout. If you’re ready to get out there and catch your dinner, here are the seven best places to fly fish in Nebraska. Located in the Southern Central part of the state, Elm Creek is ideal for fly fishing and catching rainbow trout. This well-stocked area offers public access and plenty of vegetation, giving it fertile ground and plenty of shady, cool places to cast your line. With incredible wildlife, waterfalls, and dramatic bluffs, the area where the Niobrara River winds through might just be one of the most beautiful parts of Nebraska. 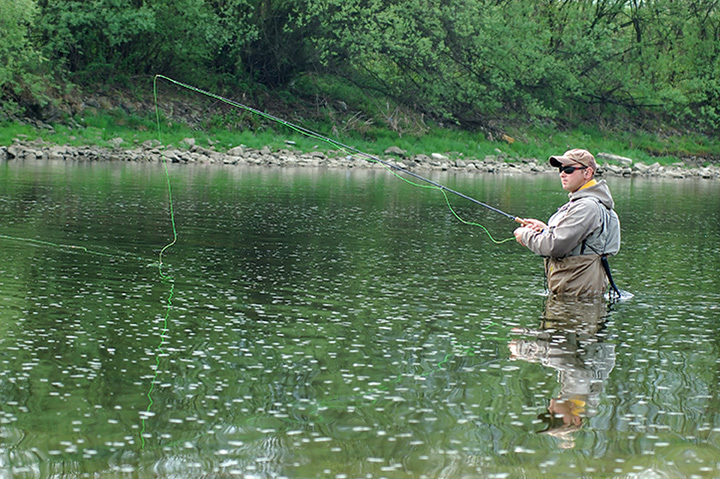 For fly fishers, there is plenty of opportunities to catch brown and rainbow trout here. Public access to fishing areas is available near the Agate Fossil Beds National Monument. As one of the most popular recreational areas in Nebraska, Two Rivers is also a great spot for fly fishing and catching trout, which are put in by the Parks and Recreation Department each year. At Lake Ogallala, fly fishing enthusiasts will find plenty of sizable rainbow trout to catch. Due to the dam, there is a mile stretch of water that serves as a very fruitful spot for trout fishing with plenty of public access spots. Located in Northeastern Nebraska, Verdigre Creek offers a good sized trout population that is perfect for any fly fisher seeking the classic trout fishing experience. Verdigre Creek is also a serene spot for brown and rainbow trout, which are stocked weekly by the Grove Trout Rearing Station. Another fantastic spot to fly fish in Nebraska is Long Pine Creek, a tributary of the Niobrara River. This body of water is the perfect breeding ground for rainbow and brown trout and public access is available at Seven Springs and Camp Witness. Head further downstream for an even larger catch! Lake McConaughy is another great spot for fly fishing. It is famous for being one of the best places in the Great Plains region for walleye and trout fishing due to its colder temperature and well-aerated waters. View more Nebraska Fishing Holes.